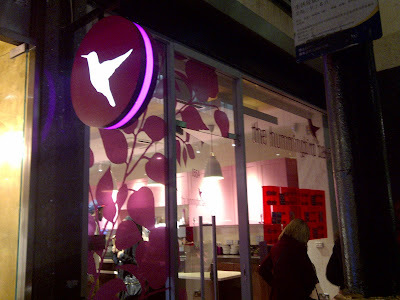 I finally went to the humming bakery in Soho!!! I've never been and i was excited to try one of the things i've been making for months. I absolutely love the shop. Its so small and pretty. Love the box too. Presentation is very important. Loved seeing all the things i'd made and i'll definitely be going back soon to try something else. I decided to buy a red velvet cupcake because i got it wrong the first time i tried to make it so i thought this would be a good time to try again. When they got out of the oven they were a nice satisfying pink and i couldn't wait for them to cool so i could put the cream cheese frosting on them and taste. Opened the box and did a little comparing. It definitely tasted better this time around and even if it wasn't exactly like the one i got from the shop i must say i'm satisfied with what i got. Although a few things made me wonder if the recipes in the book are what they really use. My cream cheese frosting was whiter but tasted exactly the same. My cake was a duller red and the texture was softer. They must use a food processor (not hands like i do) for the crumbs because it was so powder-like. it does look better. it prolly tasted different cuz of the frosting. and ur frosting looks yummy. what is it?